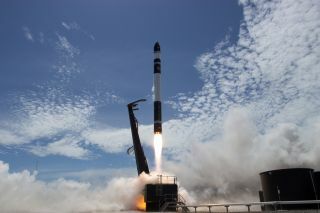 A Rocket Lab Electron rocket lifts off on Jan. 20, 2018, from the company's launch site on New Zealand's Māhia Peninsula. The Electron delivered four satellites to orbit during this flight, which was the second ever for the small-satellite launcher. SAN FRANCISCO — Rocket Lab is aiming high. The California-based company plans to make space much more accessible via its 57-foot-tall (17 meters) Electron rocket, which can loft about 500 lbs. (225 kilograms) of payload to Earth orbit on each $5 million liftoff. The Electron's first commercial mission, called "It's Business Time," was originally scheduled to lift off in April but is now on track for a November launch, company representatives have said. Space.com: Private spaceflight is really taking off, and satellites are getting smaller, cheaper and more capable. What do you see happening in the next 10 years or so? Are we really on the verge of a spaceflight revolution, like so many people say? Peter Beck: What we're seeing in space right now is kind of like an analog to the birth of the internet. Because what we have right now is a really big barrier to go and do amazing things in space. Imagine putting yourself back in time when we've just sent the first email. If I'd sat with you back then and told you all of the things the internet was going to create — you know, Twitter and Tinder and all these crazy things — you would say, "That's just absurd." You'd call me crazy. That's really where we are in space right now. We're on the verge of creating unprecedented access — unprecedented access to space, for unprecedented access to information. It's kind of one and the same. It's just an incredibly, incredibly exciting time to be in space and to be right at the forefront of creating that access to space. That's what gets me up in the morning. Rockets are cool and all, but it's really what can be done with that access, what can be done with the small-satellite revolution. The common thread here for us is [that] America, as a country, went to space 28 times last year. With SpaceX, ULA [United Launch Alliance], everybody — 28 times. Now, we have customers that have on the order of hundreds of spacecraft, all requiring different planes and orbits. It's not like you can just jam them all on one rocket and spit them out. There's a major disconnect here between what's current and what's required. So, the real enabler here is frequency. It's not even cost — it's frequency. Rocket Lab founder and CEO Peter Beck stands with the "Humanity Star" satellite, which launched aboard the second-ever flight of the company's Electron rocket, in January 2018. Space.com: And we could see a frequency ramp-up relatively soon. OneWeb and SpaceX want to start getting their internet-satellite mega-constellations — hundreds or thousands of spacecraft — up in the next few years. Beck: Right. But we don't even model those standards at this point. What gets us really excited is the 10- and 20-spacecraft constellations. Because with sort of 20-odd spacecraft, you can achieve tremendous capability on Earth. What we see from customers right now is not one or two cubesats or whatnot. We're selling multiple bulk buys of numbers of launch vehicles to populate constellations. Although these mega-constellations get all the news, there are incredible constellations in the 10s and 20s that are kind of flying under the radar. Space.com: The early days of the internet were pretty messy, and spaceflight might get messy soon as well. With so many more satellites going up, Earth orbit could get really crowded with space junk. Do you see that potential issue just working itself out, or do we need to be really proactive about it? How do we manage that? Beck: This is one thing that we really take the lead on. We don't want to pound our chests on it, but we aim to be the most prolific launch vehicle going to orbit, and with that comes enormous responsibility. So, when we take a spacecraft to orbit, we do it in a little bit of a different way. First, we put the second stage in a highly elliptical transfer orbit, which is not uncommon. But then, we separate off this other little stage called the kick stage, which has got its own propulsion system. We use that kick stage to circularize the orbit and deploy the spacecraft. Then, we flip it [the kick stage] around and deorbit it. Because we left the second stage in this highly elliptical orbit, it deorbits really quickly. So, we really leave only the spacecraft in orbit and not all this other stuff with it. Everybody else does that circularization burn with the second stage. And you put up 20 times the mass of the spacecraft in the second stage — it's just dirty. Space.com: Do we need to take active measures like that with the spacecraft themselves? Like, put sails or kick stages on the satellites in these coming mega-constellations to make sure we can bring them down quickly? Beck: On our next flight, we have a hosted payload which is a drag sail. So, we're actually using that drag sail as an experiment on the kick stage, to understand its effects. There are a lot of technologies that are being developed. I think we will see a lot of that. Space.com: So, your next flight is coming up in November. And there'll be another one shortly thereafter, to try to get the cadence up? Beck: Right thereafter — for the last year, we've been planning to get to the one-a-month cadence. And we had a motor-control issue that we wanted to resolve. We could have put a vehicle on the pad straightaway — we could roll a vehicle out to the pad literally now — but when you roll something out with a known issue, it carries risk. That's one of the differences between Rocket Lab and some of the other emerging companies: Where we're at right now is we've got wonderful investors. We're hugely well shored-up, well-backed. So, we're not racing between [funding] series rounds and series rounds trying to meet certain milestones. We're well-backed, so for us, it's really about making sure we don't take unnecessary risk and [about] bringing a vehicle to market that's ready to have this high cadence. Space.com: There are a few other companies that are trying to do pretty much the same thing you guys are trying to do — small rockets, frequent and inexpensive launches. Do you think this market is big enough for all of you to survive, or will some of them fall by the wayside? Beck: I think you'll see some consolidation. I think there's probably enough for two, maybe three. We'll see. It really depends on how successful those two or three are, but I think we'll see a lot of consolidation in the market. Space.com: So, do you have everything all lined up and ready to go? Or are there still some significant hurdles — technological or regulatory stuff — to overcome? Beck: I think we're in a really good spot. But, if I'm honest — what are the things that [make it hard to achieve a] higher launch frequency? One of them is most definitely regulatory. The time to get licenses, the time to process the launch license stuff from the FAA [Federal Aviation Administration] — it's not down to the time frame that it needs to be. We're very fortunate that the FAA has been really engaged with us to try and work through solutions to meet that frequency problem. They understand that you can't wait six months for a launch license. It just doesn't work. Space.com: We've seen that kind of movement in several different areas recently, like Congress looking to streamline the mining of space resources. It's tough to turn a giant ship, obviously, but it seems like that's starting to happen. Beck: Yeah, it's one of those things. A small tugboat pushing on the side of a giant ship — over time, the ship can turn a 180. It's very difficult to turn a 180 immediately. But there's enough small tugboats on the ship now that it's really starting to turn in the right direction. Space.com: Is the once-a-week flight cadence your goal over the long haul? Or do you eventually want to go even more frequently? We're conservative in the fact that we stand back from the mega-constellations and we just sort of focus on the 10s and the 20s. That's kind of what we model our business around. But that's not to say that we're not talking to folks that have [constellations] in the hundreds [in mind]. Space.com: So, you're conservative in a business sense, but you're really optimistic about what the future holds, right? If we had another conversation 10 years from now, do you think the landscape would be vastly different? What sorts of changes would we be talking about? Beck: Oh, vastly different. This is a tough one, because I honestly believe that the biggest thing we're going to get in space, and from space, is yet to even be thought of. I wouldn't even like to predict what the future looks like, because what we're trying to achieve here is to create an environment [in which] to innovate, to experiment and to provide new services, [an environment] that has never been available before on a wide scale. When you think about a spacecraft, it's the only piece of infrastructure that humans can make where literally one little box of electronics can influence tens of millions of people's lives every day. You know, there's a wind satellite we put up earlier this year that literally provides weather services every 90 minutes to a large number of the countries on this planet. People are deciding to get married or not to get married, to go to war or not to go to war — all over the spectrum, they're making decisions from this data. It's that global nature of space that can have this global effect. Space.com: That covers most of what I wanted to ask you. Is there anything else you'd like to talk about? But on the flip side of that, Electron is the beginning for us. This is not the end point. Space.com: So, what is the end point? Beck: Well, I think the end point will look like something that everybody can recognize. I know that's not a great explanation. But I think the end point for us is that in 10 years' time, a really significant change has occurred. Hopefully for the better — I would've screwed up if it's for the worse. Beck: That would be a fail. A giant fail.